Two iconic hot dog stands are catching some of the buzz over this year’s baseball playoffs by waging a snarky Twitter battle over whose city has the better team—and taste in dogs. 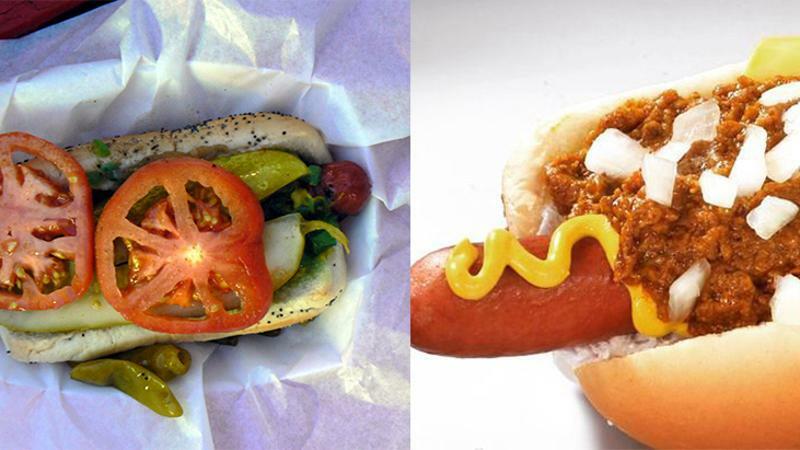 Putdowns of the Los Angeles Dodgers and Chicago Cubs have morphed into insults traded back and forth by Pink’s Hot Dogs and The Wieners Circle—fast-food institutions within their home cities of LA and Chicago, respectively. The cult favorites have traded digital barbs about everything from sauerkraut to kale and even celebrities like Harrison Ford and Bill Murray, snagging considerable free publicity in the process. The Wieners Circle is known for serving coarse insults along with its acclaimed Chicago-style hot dogs, while Pink’s Hot Dogs is a chili cheese dog staple frequented by celebrities for more than 75 years. Both are dedicated cheerleaders for their local MLB teams. They agreed on Tuesday to a wager hanging on the outcome of the best-of-seven series, which the Cubs currently lead by three games to two. If the Dodgers win, Wieners Circle will hand out free chili cheese dogs for an hour on Oct. 25, the first day of the World Series. The Chicago hot dog stand will also donate its earnings from its best two hours of sales to the charity of Pink’s choice. If the Cubs win, Pink’s will serve 108 Chicago-style dogs and donate $1,908 to the charity of The Wieners Circle’s Choice, a sly reference to the Cubs being shut out from a championship for the last 108 years. Buried beneath the provocative language and one-upmanship is a closely watched, mutually waged social media campaign surrounding a playoff series with high viewership ratings. With more than 10,000 Twitter followers between both brands—Pink’s has the vast majority, with more than 9,000—many in both Chicago and Los Angeles are following the playful banter between the two.